The Financial Services Compensation Scheme (FSCS) is the UK’s statutory compensation scheme for customers of authorised financial services firms. This means that FSCS can pay compensation if a firm is unable, or likely to be unable, to pay claims against it. FSCS is an independent body, set up under the Financial Services and Markets Act 2000 (FSMA), and funded by a levy on "authorised financial services firms". The scheme covers deposits, insurance policies, insurance brokering, investments, mortgages and mortgage arrangement. The FSCS came into existence in 2001 and replaced former multiple schemes. Between 2001 and 2006 the scheme paid out close to 1 billion pounds in compensation. In the period from 2006 to 2011 the financial crisis resulted in compensation of over 26 billion pounds being paid out by the FSCS. In 2008 the FSCS was given a loan by the Bank of England in order to be able to guarantee the deposits of customers of Bradford & Bingley. The compensation limits were last amended in 2010 to bring them into line with the EU (and EEA) deposit guarantee requirements under the European Union directive 94/19/E. 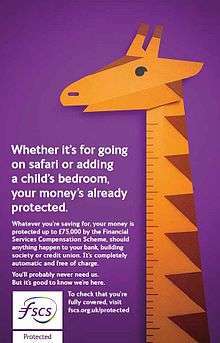 On 31 August 2012 UK authorised banks, building societies and credit unions were required to display information about FSCS protection in branch and online, this included posters and window stickers. This action followed the introduction of new Financial Services Authority (FSA) rules obliging deposit takers to display information about FSCS protection available to consumers. The UK branches of foreign banks from the European Economic Area (EEA) have to specify that their customers are not covered by FSCS and clearly state which national scheme provides protection. On 14 January 2013 FSCS launched a consumer awareness programme, aiming to reassure consumers and boost confidence, thereby aiding financial stability. It follows on from the disclosure requirements and uses icons of protection to engage with the consumers and highlight the safety FSCS provides to savings and deposits. The advertising programme is scheduled to run in national press, radio, online and digital. The FSCS is funded by levies on firms authorised by the Prudential Regulation Authority and the Financial Conduct Authority. FSCS's costs are made up of management expenses and compensation payments. FSCS protects UK authorised banks, building societies and credit unions up to £75,000 in the event of their insolvency. If deposits or savings are in a joint account the total of FSCS protection doubles to £150,000. FSCS protection is free and automatic. If anything happens to your bank, building society or credit union, FSCS will automatically refund your savings. In the vast majority of cases savings are refunded in less than 7 days. From 3 July 2015 some types of temporary high balances of up to £1,000,000 are protected for up to six months. (for claims against firms declared in default from 1 January 2010). (for business conducted on or after 14 January 2005). ↑ "Annual Report and Accounts 2011/12" (PDF). FSCS. Retrieved July 14, 2012. ↑ "Your money is safe, FSCS tells Bradford & Bingley depositors" (PDF). FSCS. 29 September 2008. Retrieved July 14, 2012. ↑ "New deposit guarantee limit to be £85,00 0". FSCS. 17 Dec 2010. Retrieved July 14, 2012. "What if Northern Rock goes bust?". BBC News. 14 September 2007. Retrieved 15 September 2007. "FSCS - Consumer home page - What we cover - Eligibility rules - Compensation Limits". FSCS. Retrieved 13 February 2010. "FSCS - Consumer home page - What we cover - Questions and Answers". FSCS. Retrieved 13 February 2010. "New deposit protection limit coming on 1 January". FSCS. Retrieved 3 July 2015. "New protection from today for temporary high balances". FSCS. Retrieved 3 July 2015.